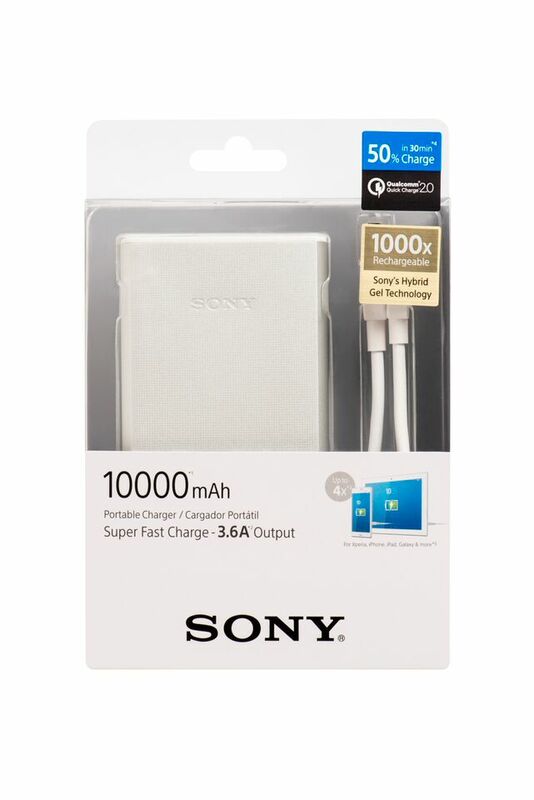 Officially licensed and certified to use Qualcomm Quick Charge 2.0 Technology, the Sony CP-R10 Portable Charger will charge your latest phone up to 75% faster. With a compatible phone, lab tests have demonstrated that a mobile battery can be charged from empty to at least 50% in as little as 30 minutes. The fact that this is a portable battery pack makes it so much better. Compatible models are Samsung Galaxy S6/S6 Edge, Note 4/Edge, Nexus 6, Sony Xperia Z4, Z3+, Z4 Tablet, Z3, Z3 Compact, Z3 Tablet Compact, Z2 Tablet, Motorola Droid Turbo, Moto X 2014, HTC One M9, HTC One (M8), Oppo Find 7, Desire EYE, LG G Flex2, G4, Xiaomi Mi3, Mi4, Mi Note, and more to come, with newer flagship phones mostly sporting Qualcomm’s tech. This is a premium feature, but definitely handy. The Sony is one of the first few to come up with a portable charger that supports Quick Charge 2.0, with over 3.6A output. No more needing to leave your phone tethered to an umbilical cord when outdoors. A juice up of ten-fifteen minutes should last you for a good couple of hours. For users with non-compatible devices, the CP-R10 is also able to charge your devices via its 5V 2.0A output. The portable charger’s high power capacity of 10,000mAh enables you to fully charge your smartphone up to four times before it runs out. However, if you don’t need the Quick Charge feature, perhaps you should be looking at cheaper battery pack alternatives, Xiaomi for starters. Housing a powerful Sony-made Lithium-ion polymer battery utilising Sony’s hybrid gel technology, the CP-R10 is able to retain 90 per cent of its capacity even after 1,000 charges. It comes with a convenient 4 LED light indicator and includes a special thermal protection micro-USB cable for added convenience of charging as and when you like. The CP-R10 USB Portable Charger weighs approximately 275g and will be available in Singapore at all Sony stores and selected authorised dealers from August 2015 onwards. Unfortunately, pricing details are not available yet. Yippie! Final Fantasy VII Remake is Coming!